Its 7 a.m. Bleary-eyed, you stumble out of bed to the kitchen, where you flip on the coffee machine without even looking at it. Eyes still shut; you limp outside and grab the newspaper, shuffling back inside. It’s 7:05 a.m. In exactly 15 minutes the kids will be up, and at 8 a.m. the bus will pick them up. By 8:30 a.m. you’ll be in the car and on the road, arriving at work at precisely 8:50 a.m. Lunch will be from 12 p.m. to 12:30 p.m., and at 5 p.m. you’ll head home. Sometime that night, inevitably, Aunt Sally will call with yet more bad news (as if her broken hip wasn’t bad enough), and your son Jim will “accidentally” lock Trevor in the closet — again. You’ll be in bed by 10:30 p.m., and the next day you’ll repeat the exact same process. To those that dream of an escape from their drab daily routine, Belgian-born photographer Viona Ielegems is an ideal role model. Known as a “mistress of fantasy and queen of mysterious worlds,” Ielegems has gained an international following for her bold, imaginative photographs that often feature fantasy or fairy tale themes. Her pictures are inimitable, ingenious, and so surreal that it’s often difficult to tell whether or not they’re photographs at all. Women, men, beauties and beasts, all play a part in Ielegems’ imaginative creations. Each photograph is unique, but the message is always the same: every photo encourages the viewer to keep on dreaming. Ielegems’ work also often celebrates the elegance and gracefulness of women, a refreshing change from the cheesy oversexualization many photographers within the genre resort to. But the woman behind the fairy tale princesses and stunning scenery is more than just a photographer. A costume designer, she makes all the outfits that appear in her photographs herself. And several times a year, she organizes large social events such as Victorian picnics or balls where people dress up in outfits so stylish, they make haute couture look like a half-off sale at Macy’s. In short, Ielegems doesn’t just specialize in fantastical art: she lives it. After rescuing a nearby damsel in distress from a ferocious dragon and successfully locating a golden goose, GALO was able to catch up with Ielegems. Here’s what she had to say. GALO: How and when did your interest in photography first develop? Viona Ielegems: As a teenager, I dreamed of being an artist. Drawing and painting were my passion. I attended art school in Antwerp, Belgium. After graduating I decided to give photography a try. My father had been teaching photography [throughout] his whole career and I wished to follow in his footsteps and become a photographer. GALO: Why photography versus other artistic forms? VI: I learned that through photography, I found a perfect way to create the scenes that I was unable to draw. GALO: Much of your work can be described as “fantastic art,” as many of your photographs have fantasy, fairy tale, or historical themes. Why these subjects? VI: Those are the themes that have always inspired me. Since my childhood, I’ve always been fascinated by old folk tales, history, and fairy tales. 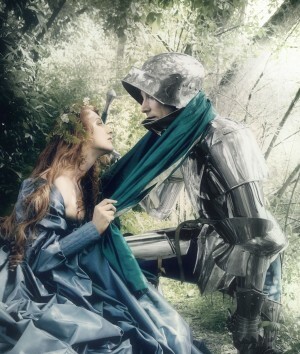 The romantic idea and feeling of those fairy tales are the morals of my life and work. There is a lot of sad reality around us, so much that it often threatens to dominate our thinking. I want to show another reality, one where everyone can step through the magic veil and become a part of this fantasy world. GALO: What are some of your influences – people, places, ideas, things, etc.? VI: I very much look up to the painters of the pre-Raphaelite art movement (Waterhouse especially), but also the great artists of Art Nouveau. Those artists understood the meaning of elegance and beauty perfectly! Next to artists from the past, I am very much inspired by nature. Forests and old trees are often the scenes of my photographs. And another very important part of my work and inspiration is historical costuming. Elaborate costumes and jewels are automatically translated into interesting photographs. GALO: You are quite involved in the European alternative scene. What got you involved with that community, and how does it influence your work? VI: With my romantic and sometimes “dark” photographs, I found a lot of response and fans in the alternative scene. They seem to perfectly understand the reason and function for this kind of work. They often look for many things to be different from the rest of the world. This can go through fashion, music, or art. Many of them secretly dream to live in another world or time and find the perfect portal to make this mind-switch through my photos. The alternative scene used to influence my photographs in my earlier work, but [for] many years I’ve been following my own path of interest and doing this I notice that I myself now influence the alternative scene.